South Park is downright flat-out hilarious... period! If you've seen it, then you know. If you haven't seen it, then you need to go out right now and see it. If you have seen it and think it's just plain dumb, then leave now because you're obviously a loser with no funny bone. Today, right now, I'm here to tell you about a South Park compilation DVD titled Christmas Time in South Park. It contains all seven Christmas episodes, starting from season one and going to season eight. The Christmas episode for season five was omitted because there was no Christmas episode for season five! There was also no Christmas episodes following season eight. Before going any further, I have to say that I have already seen each of the episodes on this DVD before, back when they originally aired (and in reruns as well). Still, this little fact didn't stop me or my wife from enjoying each of the episodes again, and we laughed just as hard as we did the first time around. It just goes to show that if you have spectacular writing and people who truly know what funny is, you don't need state-of-the-art animation to bring a joyful experience. The disc starts with the first South Park Christmas episode (not including the original Spirit of Christmas short), Mr. Hankey The Christmas Poo. When everyone in South Park tries to remove anything and everything that is offensive to somebody, the town winds up losing the Christmas spirit. And who better to restore this spirit than a non-denominational holiday season figure named Mr. Hankey! Who cares if he happens to be a piece of poo! The next episode is titled Merry Christmas Charlie Manson! (a parody on the title of the Charlie Brown Christmas special). Cartman goes to visit his family, with Kyle, Stan, and Kenny coming along for the ride, but not long after they arrive one of Cartman's relatives breaks out of jail and holds up at the house. His partner, Charlie Manson, then has a little Christmas adventure with the boys at the local mall, where he learns a little something about the holiday spirit. Mr. Hankey's Christmas Classics comes next, and is a bit different that the other episodes. It consists mainly of the characters performing hilarious holiday songs, with Mr. Hankey hosting. No real plot, but the songs are to die for. Then we come to A Very Crappy Christmas , where Mr. Hankey seems to be a no-show only days before Christmas, leaving the town with little Christmas buying spirit, forgoing gift-giving and choosing instead to just stay at home and celebrate love and family. Well, the boys won't stand for it, so they go about creating an animated special, which turns out to be the actual, original short that kicked off South Park: The Spirit of Christmas . The second-to-last episode is called Red Sleigh Down , and is about Santa Clause being captured by terrorist while attempting to deliver presents to Iraq. It parodies several war flicks, and is one of my top ten favorite South Park episodes of all time. And finally, we have It's Chirstmas In Canada , where the Broflovskis (Kyle's family) loose custody of their little baby boy, Ike, when his original Canadian birth parents come to claim him. Now it's up to the boys to raise the money and go to Canada to get Ike back! 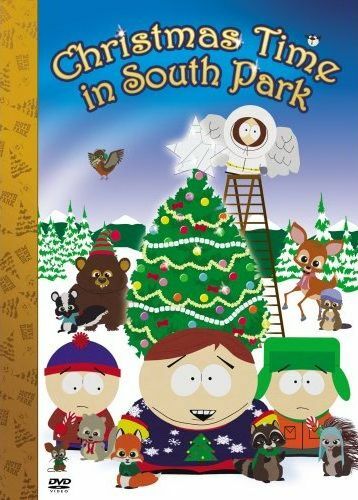 Christmas Time in South Park was released by Paramount Home Video on November 13, 2007.